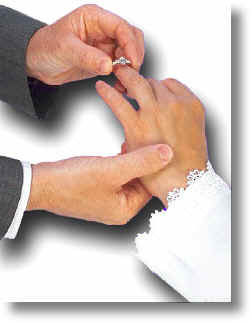 Exchange your sacred wedding vows in the Fredericksburg Tx Hill Country. Whether your wedding is a traditional religious ceremony or a civil wedding, your wedding vows are the most personal and sacred words the bride and groom can express. While some churches have restrictions regarding the vows they can be flexible during this moment in the ceremony but it is always advisable to determine this in advance. Having the personalized vows written beforehand can make this request easier for some church officials to accept. It is generally understood that the bride and groom have the final word. Some ceremonies allow family and long-time friends to offer their own readings. While this can be fun and entertaining, especially for less formal weddings, it is always a good idea to offer some guidelines so there aren't any unpleasant surprises.